Prepolling in Goulburn has been busy and has allowed candidates to interact with voters as the campaign draws to a close. 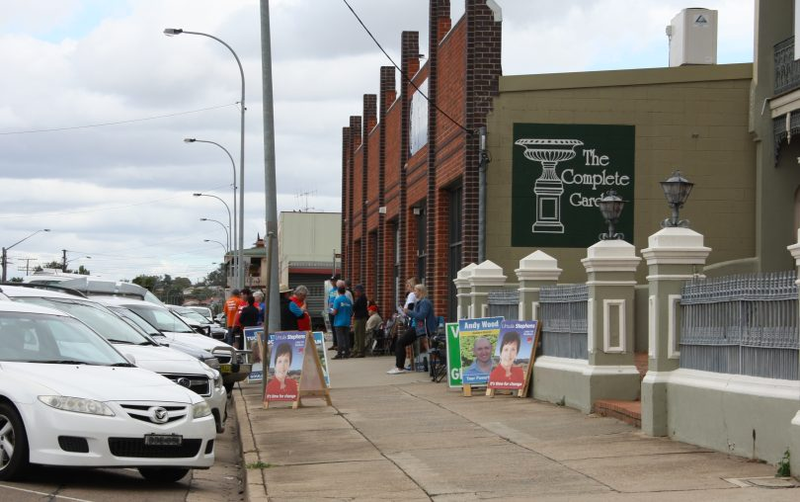 When voters go to the polls on Saturday in the Goulburn electorate they’ll have a strong field of local candidates to choose from, reflecting trends towards greater voter pressure for action on local issues. This trend is not likely to sideline the major parties but Australia’s preferential voting system is putting increasing pressure on them. A key decider locally this Saturday might be where preferences fall and, with seven candidates representing a variety of issues, the ball is definitely in the voter’s court. For the Shooters, Fishers and Farmers Party (SFFP), the focus is on making sure services are delivered for the Goulburn electorate after what it sees as ‘neglect’ over decades. “We need to see the Nurses and Midwives Association’s (NMA) 1:4 nurse-patient ratio is adopted across the state; hospitals upgraded for the future and staffed correctly. Local schools need maintenance issues resolved and important decisions need to be returned to them rather than suffering departmental edicts,” SFFP candidate Andrew Wood said. NSW Liberal Democrats candidate Dean McCrae is vocal about returning power to the electorate. He’s ‘anti-pollie’ and believes the government has been relegating and interfering with individual liberty and enterprise for too long. Local issues continue to be the focus of major party campaigns. Coalition candidate Wendy Tuckerman says services, education and health are priorities. “As a sheep grazier and a local Councillor I have seen firsthand the difference made by the NSW Liberals’ record investment in health, education, and infrastructure. “We are building new education facilities such as a new primary school in Murrumbateman, upgrades to schools such as Yass High, rolling out air conditioning and wiping the school maintenance backlog to zero. We’re hiring more teachers, mental health experts, providing before and after school care for every primary school child and subsidies for pre-schoolers,” Ms Tuckerman said. Goulburn and surrounding regions are growing, with voters seeking strong local representation as they head to the polls. One Nation candidate Richard Orchard submits the NSW election is all about local issues as the State Government is a provider of services. He believes the major parties have dropped the ball on critical local concerns such as infrastructure upgrades. “The Barton Highway upgrade is an important national link that must be completed. Similarly, Yass has undrinkable town water, Boorowa has no secure water supply and despite Goulburn being a provincial centre, there’s a pre-election bidding war [from major parties] on the local hospital redevelopment funding. It would be nice if they spelt out what the final product is going to be and commit to it,” Mr Orchard said. Business decentralization to Goulburn, commuter needs via upgraded transport services and links, and the rail and bus timetable are also high on the list as is advocacy for villages surrounding major centres. Local Animal Justice Party candidate Tracey Keenan has entered the race to highlight the needs and protection of animals and wildlife. Bushland clearing and funding vet and other bills for wildlife rescue groups are priorities. Stopping the cycle of abuse that leads to domestic violence and greater support for children are also focus areas. All candidates were given an opportunity to contribute their focus issues however at the time of publication, the ALP and the Greens had not commented. More information here on the ALP candidate Dr Ursula Stephens’ website and that of Greens’ candidate Saan Ecker.